This sounds all so easy to create as most of us have created this in our backyards at some point. But this can be difficult for a restaurant that plays out this scenario each day with consistent regularity. Anderson’s is such a spot. Located in the Medical District on Harry Hines at Butler, just a few blocks from the very best beef enchiladas in Dallas (Escondido), Anderson’s can prove difficult to enjoy for lunch due to the huge crowds. Besides having a great location for most any restaurant, the food is affordable and spot on. 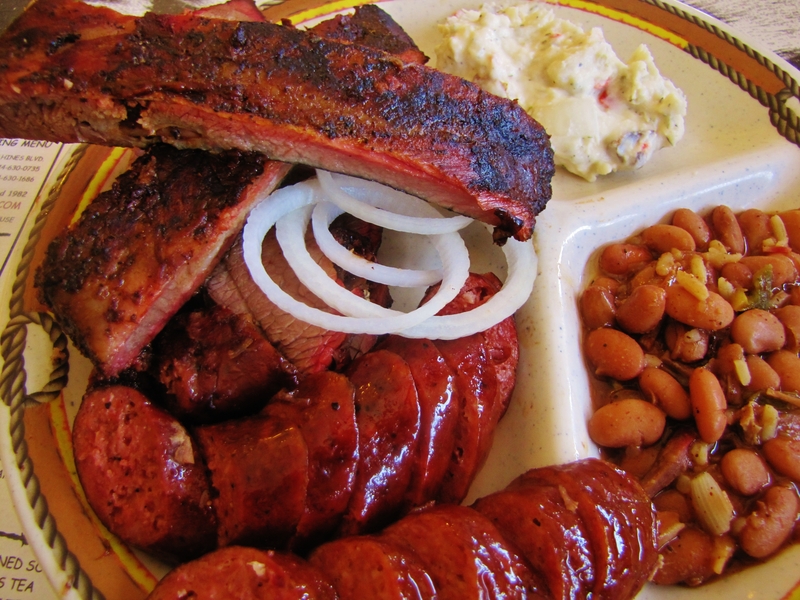 Our most recent visit included a three meat platter with sausage, brisket and ribs. Note that the time of day was near closing time, a death rattle for most smoked meats. This was not the case yesterday as the meat held up even to its final breath at 2:30 in the afternoon. The ribs have that marvelous tell-tale smoke ring and crisp crust, all the while relenting to a tender moist bite. The brisket was still juicy and flavorful and begged another mouthful. The sausage is not exactly our favorite in Dallas, but still makes a passing grade. It was smoked well, but needed more spices and a coarser grind. The hot link is a much better option. We did not have the pulled pork on this visit, but earlier samples were perfect. We generally pass on sauces with our BBQ, but sampled some dabs for good measure. The house sauces are rich and make a nice addition to the meat. The jalapeno is especially good and adds a kick to that sausage, which it really needed. 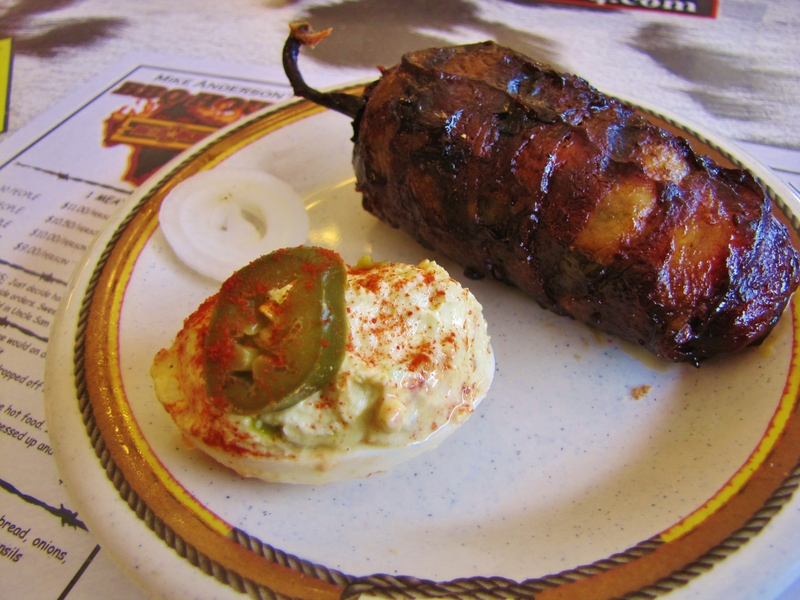 A surprise meat item was Anderson’s stuffed jalapeno that is bacon wrapped and plied with copious amounts of brisket. The result is dabbed in sauce and smoke for a fine appetizer. Grab a few of these mammoth jalapenos and you have a complete lunch. Add one of the made-in-house sides including the black eyed pea salad or dill potato salad and you are on your way to a nap. There are plenty of serve-yourself sides to choose from, and all delicious the way your mom might have made them. Another complete meal option is the Monster Spud that is also jammed packed with meat. You may be compelled to finish this baked potato, but it would take two lumberjacks and a seeing eye dog to clean this plate. There are also many choices for desserts including a slew of cobblers, all home made. The banana pudding might be more traditional and this version is excellent. 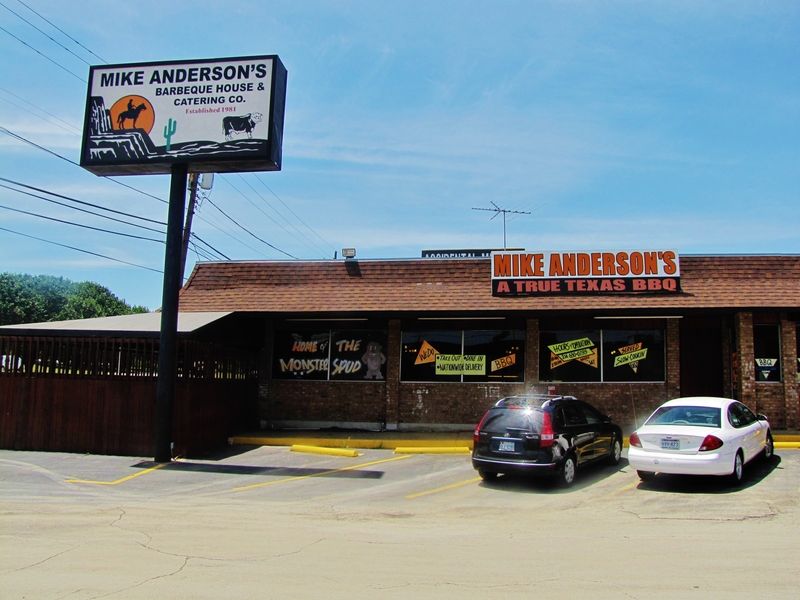 Mike Anderson’s is one of our top favorites for BBQ in the Dallas area.